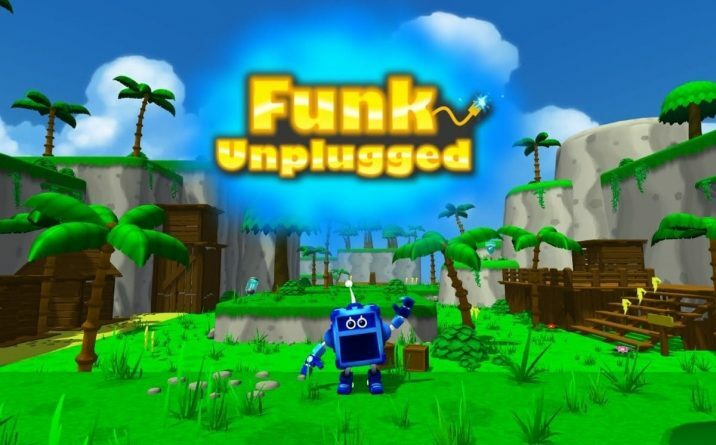 Funk Unplugged is a 3D Platformer where you can use your musical powers to save the world! Ampy, an amplifier who has been in service for decades under some of the greatest rock legends of all time, finds himself put back to work when the G-Bots threaten to steal music away from everyone. Use and unlock Ampy’s abilities, like Double-Jump, Wall-Jump, Transform, and more to traverse the world and save the day! The player will travel to the various areas to collect and fix the stolen Platinum records. The Director and his henchmen have taken these records and are instituting their own no-fun rules on everyone! The Board of Directors must be stopped, and only Ampy is up for the task. Travel to the Treble Tropics, Arctic Aria, Beathoven’s Castle, and New Tempo City to fix the records and stop the G-Bots! In between missions, Ampy can change his appearance at the Ampy-Theater in the hub world, as well as try out some bonus levels, called Soundscapes! Use your abilities to navigate through over a dozen levels in search of not only the Platinum Records, but for Gold Record and Jolts to unlock new moves and customization options!